If your client likes blinged-out nails, have her try a Pavé pedicure. Valerie Soto of Zenka Luxe in Manhattan Beach, Calif., has been offering Pavé pedicures for about a year. “It’s been extremely popular,” she says. “Our salon is located on the beach; everyone is always in their flip-flops, and the Austrian crystals really sparkle in the sun.” Sota says the pedicure sells itself. Most of her clients who come in to book it say they saw it on someone else and had to try it. Also, all the techs at the salon have it on their toes, which makes it easy to upsell. Soto says the application technique is not hard to learn, and the company offers one-on-one training and certification. “As long as you are trained properly, it makes sense to use the template and apply. Take some time to master applying it properly since everyone’s toenail size is so different.” Soto charges between $50 and $100 depending on if the client is doing big toes only or blinging-out all 10 digits. If your client likes to change her polish often, have her try color-changing nail polish. If your client likes body piercings, have her try nail piercing. Nail piercing is a quick way to add a bit of edginess to any manicure (and much less painful than body piercing!). Eva Jenkins of Extraordinary nails by Eva in Bellevue, Neb., charges $5 per piercing. She used the carbide cone-shaped drill bit to do the piercing on the manicure shown here. “Without applying too much pressure, I start with the top and let the drill bit do the work,” Jenkins says. “I finish the job by going underneath the nail — again, not applying too much pressure — until I can see the tip coming through the top.” Add a jump ring or cute charm, and your client is good to go. If your client likes shiny metallic jewelry, have her try foil nail art. Perfect for the client who comes in dripping with silver and gold, foil nail art will complement her gleaming rings and bangles perfectly. Oana Schultz of Perfectly Polished Nails in Milwaukee, Wis., likes to do foils on a black base/background, like the ones shown here. “It makes the foils stand out,” she says. “We usually mix three to four colors, but you can always do one color as a fade.” To help the foils stick better, Schultz wipes the foil with alcohol after it picks up an excess of the gel-polish sticky layer, then adds two coats of Gelish top coat. If your client likes color blocking, have her try underside nail color. If your client likes over-the-top glamour and long nails, have her try extra-long eyelash extensions. Justyna Amelia Jakubowska of the Beauty Bar in Hoddesdon, Hertfordshire, U.K., has been offering eyelash extensions in addition to nail services for the last three years, and says that most of the clients get addicted to wearing extensions. “Even if they originally wanted something glamorous done for a special occasion (like the ones seen here), they end up requesting lash extensions and fills again. And the volume extensions are widely requested by older ladies with sparse natural lashes.” Jakubowska offers classic one-to-one application as well as the Hollywood volume technique. “I like the fact that with a properly chosen set of lash extensions I can completely change a client’s face: lift droopy outer corners of the eyes, lift hooded top lids, and open up small eyes, giving the whole face a more lifted appearance.” Keep in mind that most states require some sort of license to offer eyelash extension application, but many nail techs have found that adding it to their service menu has made the additional licensure worth it. If your client likes tribal nail art, have her try body decals. Using temporary body tattoos as nail decals is a good alternative to more permanent and/or time-consuming skin designs like tattoos or even henna. Like nail piercings, they can add an edgy look to any manicure. 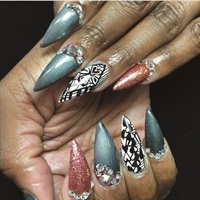 You can use them subtly or make them extend farther onto the nails and hands, and clients can add matching or complementary decals to other parts of their bodies. The manicure shown here by Cammy Ngyuen of Blossom Beauty Lounge in Redondo Beach, Calif., was done using a variety of gold SnapTats. Ngyuen charges $5 and up for the add-on. If your client likes French manicures, have her try a moonicure. For a classic, yet retro-glam look, nothing beats a moonicure. NAILS asked Sharon Trickett, a.k.a. Minnie Moons, vintage manicure specialist and go-to expert on this singular style, for some tips on creating the perfect moonicure. If your client likes showing some skin, have her try negative space nail art. If your client likes abstract/geometric nail art,have her try graffiti nail art. If your client likes high heels, have her try stiletto nails.